I will state my preferences up front. I am not a fan of CRM. It involves enormous costs that only provide value based on the abilities of the employee. CRM purists will say that is because it was implemented badly. Fair enough, but that’s the current state for most. 3) demand support from vendors to optimize existing CRM infrastructures. The value in CRM is predicated on knowing enough about the customer during each customer interaction, that they will be over-whelmed by how smart the firm/ employee is to know them so well, and reward the firm with loyalty. Reality is more like this: “may I place you on hold for one minute”, during which time the poor employee must re-read the notes from previous employee encounters, and determine a course of action. I am generalising of course, but I have called enough call centres as a customer to know this to be true. Unfortunately I also know this from viewing CRM implementations first hand internally. The core of CRM as the big vendors deploy, is what I would characterise as text based customer information, including name, address, telephone, and customer notes. The key is the customer notes. This is just a series of text, and its really hard to use that intelligently. Some are trying to develop text analysers that will produce intelligent customer information and predictive patterns based on key words. I don’t buy that. Scientists are working hard on this, but I have sat through enough presentations, to know that generally the solution comes down to requiring internal administration by large numbers of people to learn from what they are reading, and enable set questions based on certain repetitive patterns. Bottom line, today the text based notes stored within CRM systems are relatively useless. The time taken to read them during each interaction nullifies much or all of the benefit, depending on the speed reading capabilities of the agent/CSR. I am starting to see the next generation of thinking on this, and its going to be controversial, because of the enormous spend on CRM to date. I have been listening, reading and thinking about Enterprise Decision Management (James) and Improving New Account Opening (Phil), and there is something there that fills the gap for me. I subscribe to the school of thought that says loyalty stems from quality service. 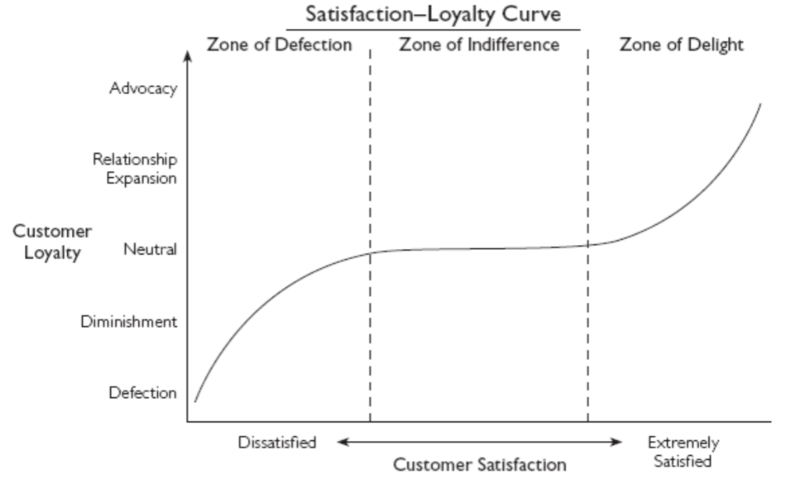 Indifferent or bad service will drive disloyalty. This study from the CFC in 2003, relates service to customer loyalty. They conclude that banks make a high return at both ends of the spectrum, really bad or really good service. There is some logic to that, because most Banks are in the middle band, and that’s the worst place to be, because your customers are neutral. Neutral means they can move between Banks with ease. If Banks want to exceed at loyalty and the revenue that drives they have to get out of the neutral service zone. Building the service enterprise requires careful consideration of the service process, and CFC addressed in the report this way. So the BPM model works for me, because its focussed on simple efficient, effective service. Next Generation BPMS – does it need CRM? Now that sounds like a cool suite of apps. Question: would banks be any more competent at implementing BPM than CRM? I’m one of those people who thinks that CRM is a great tool but that very few companies deploy it correctly. I have no reason to think banks would improve their performance by trading bloated technology for bloated process. Agree re CRM. But at least the potential exists for BPM to provide automated/ simplified processing to replace manual processes, whereas CRM introduces net new processes. User adoption of CRM applications, or any software, is always a challenge. The key is to trade off the upfront investment with the potential of sales team adoption. PipelineDeals has tackled this with a low barrier to entry and a simple CRM interface. We welcome you to try us.